One week until the kick-off meeting! +Profile in the newspaper! Thanks Kitchissippi Times! At the bottom of the article (online version only) is a list of five cool local history-themed websites I recommend everyone check out. I encourage you for sure to visit them, I'd bet a couple of them would be new to many of you! I'll have another update or two later this week about the get-together. And I'll be catching up on emails in the next few days as well, so if you wrote to me in the last few days and haven't heard back, my apologies, but I promise a reply in the next day or two. I'm spending a bit of time preparing stuff for the meeting, so there should be a lot of content, lots to talk about, and (hopefully) quite a few people to meet and chat with. Really looking forward to it! Working on a new addition for this site as well this week, which is to add a section of reference materials, for the aid of people doing research or just curious to poke around in history. So I hope to launch that in the next week or so as well, I think this could be a great resource. Cheers! The newest issue of the Kitchissippi Times came out today, and includes an article I wrote on the 100th anniversary of prohibition. Learn about how prohibition came about, how long it lasted for, the sneaky ways residents managed to continue to obtain alcohol during the "dry" period, and when/how it came to an end. Former Street Names: Russell Street (mid-1880s to 1889). 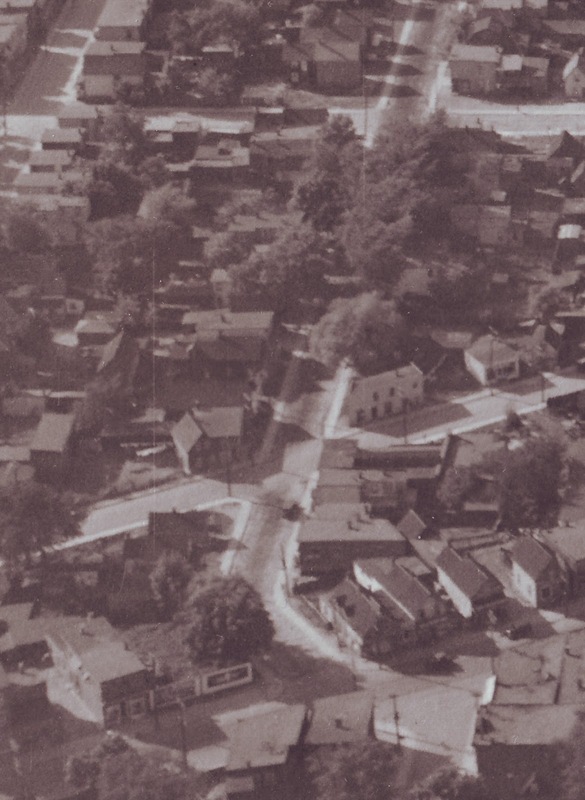 First established: Mid-1880s on an unregistered plan; first official plan was Carleton County Plan 105 in 1889. Name meaning: The street is named for Charles Hamnett Pinhey (1828-1893), youngest child of Hamnett Kirkes Pinhey (and Mary Anne Tasker), the founders of Pinhey's Point, now a heritage site on the Ottawa River. 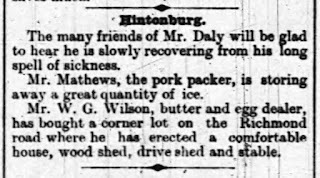 Charles was a lawyer and was appointed Clerk of the Dalhousie District in 1848, and continued as Clerk to the County of Carleton until mid-1858. 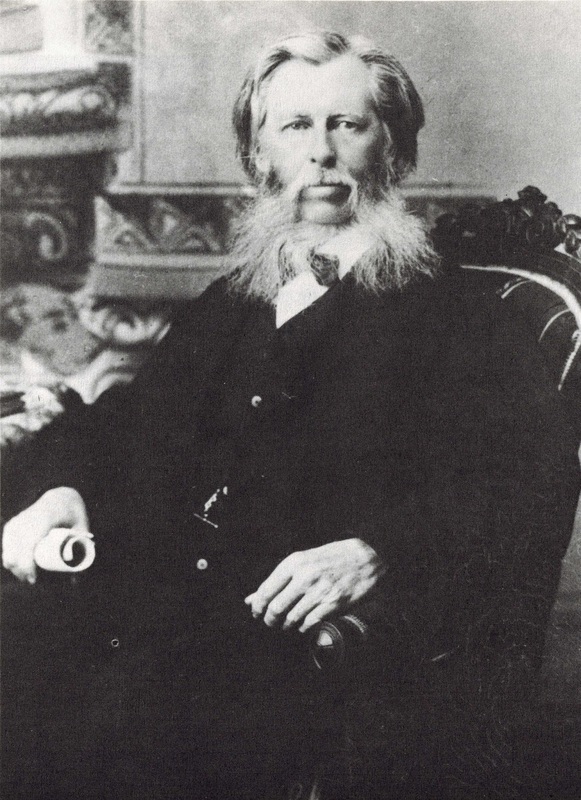 Around 1854-55, he joined John B. Lewis to form the Ottawa legal firm of 'Lewis and Pinhey'. When Lewis died in 1874, Pinhey became the senior partner, and the firm later became known as Pinhey, Christie and Hill. Pinhey was also the Secretary-Treasurer of the Bytown and Nepean Road Company (which owned the Richmond Road, then a toll road). 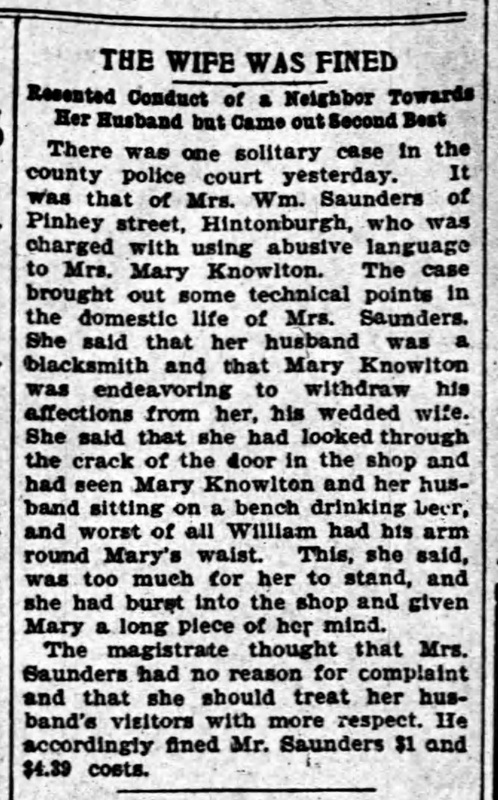 In 1863, he married Catherine Lewis, the sister of his law partner, and together they had five children. Charles Pinhey never resided in the area, instead residing in "Merton Cottage" on Victoria Terrace, a street north of Albert that connected Wellington Street to Richmond Road in old LeBreton Flats. He died on Christmas Day of 1893. How named: In 1888, Pinhey acquired a 10-acre block of land that had been owned by friend and business colleague Alexander Russell when Russell passed away (Pinhey had been the mortgage-holder on the land). A year later, Pinhey decided to take advantage of the newly-growing Hintonburg suburb by subdividing part of the property for sale. He created two streets, and named them after his family (Pinhey) and his family's hometown in England (Merton). 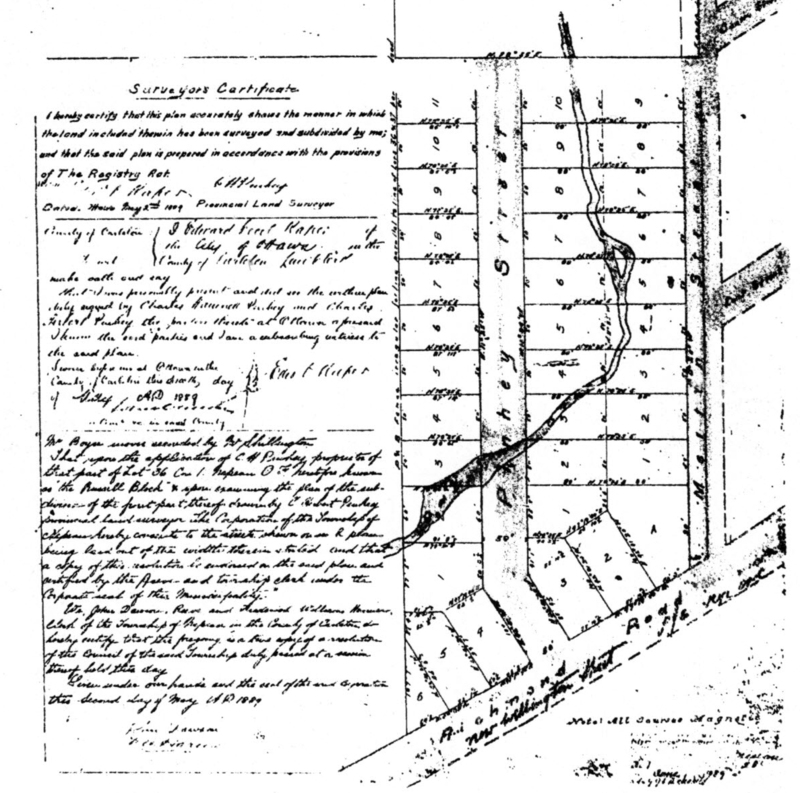 In 1831, the 200 acres of lot 36 in concession 1 of Nepean Township were sold in two halves: Robert Reid purchase the south 100 acres, while John Anderson, one of Bytown's first merchants, purchased the northern 100 acres. Anderson established a farm in the area (which would have run from Merton west to Parkdale, and from Scott south to about the Queensway) until he died around 1851. Soon after his death, his widow Janet Anderson broke the land into smaller parcels for sale to land investors from Bytown. On November 26th, 1851, she sold a 10-acre block to Alex J. Russell for 65 pounds. The deed of sale interestingly was witnessed and signed by Charles Hamnett Pinhey. Russell was a former Deputy Provincial Surveyor (1829), and in 1830 joined the Commissariat Department, serving two years on the Rideau Canal while it was being constructed. After then after working in Quebec for several years, he eventually was transferred to the Crown Timber Office in Ottawa to settle difficulties with lumbermen and to grant licenses to cut timber on the Ottawa River and its tributaries. To these duties were added those of collecting timber revenues and the inspection of other Crown Timber agencies. He was the author of “The Red River Country, Hudson's Bay, and Northwest Territories considered in relation to Canada”, published in 1869, and of “On Champlain's Astrolabe”, published in 1879. He also contributed sketches to Alfred Hawkins' Picture of Quebec (Quebec, 1834) as well as to the Canadian Illustrated News in 1870 and 1871. It appears around 1878-79 Russell had a small house built on the property (the first construction on the 10-acre block) which he rented to tenants throughout the next decade (the first was a 23-year old labourer John Martin Fuller who 40 years later would later would become the superintendent of the Island Park division of the Federal District Commission during the construction of Island Park Drive in the 1920s). The Russell family also lived on Victoria Terrace and it does not appear they ever resided in Hintonburg (Bruce Elliott in his book “The City Beyond”, noted that around 1870 Russell “built a substantial home on the north side of Richmond Road, and moved into the community”, but this cannot be substantiated through assessment roll and city directory records). At some point during the 1880s, Russell must have laid out a subdivision of his property. As evidenced in the 1887 map below, he named the street running through his property “Russell Street” (which would later become Pinhey Street), and laid out a total of 53 lots on both sides of the street, all the way north to the train tracks (now Scott). No lots were ever sold from this subdivision. of the use of the name "Russell Street"
Russell died on November 12th, 1887. The following June, his widow transferred ownership of the 10-acre lot to Charles H. Pinhey, as Pinhey was owed $2,800 plus interest from an old mortgage from 1876 that Russell had taken from him. 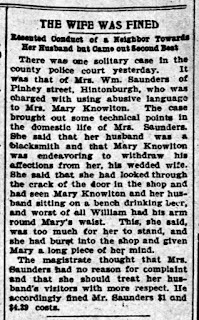 Pinhey continued to allow the tenant to remain in the existing house (at the time, it was a widow, Mrs. Catherine Fraser who was resident), but he had plans for the land. On May 2nd, 1889, Pinhey registered Plan 105 with the Carleton County Registry Office, subdividing the southern half of the property. The plan contained 36 numbered building lots of various sizes, but predominantly approx. 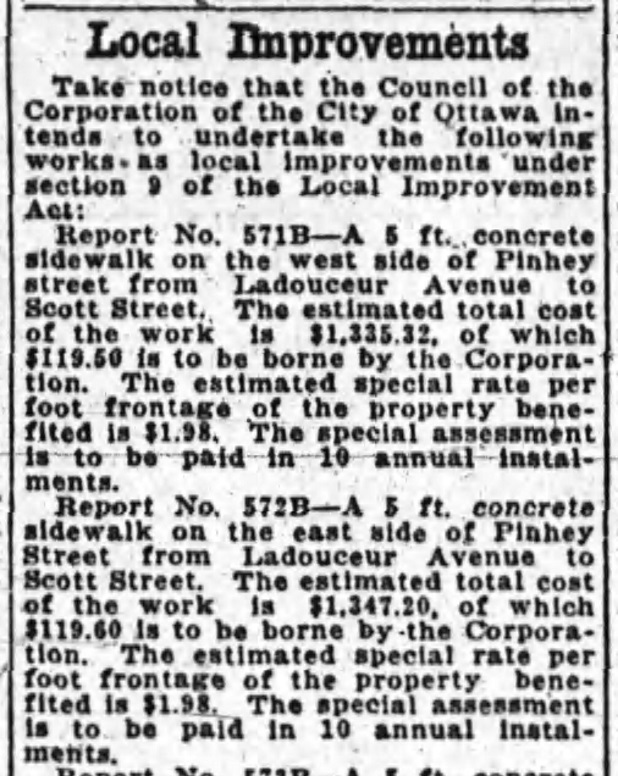 50 feet wide and 88 feet deep, and of course, created the two new streets, Pinhey and Merton. Scan from original Plan 105 drawing, showing Pinhey's new subdivision. 105. The north half would not be subdivided until 15 years later. This plan is also the first time that the odd south-east jog occurs at the very south end of Pinhey. As you'll see from the plan, Armstrong did not yet exist, and there was seemingly no reason why Pinhey could not have continued in a straight line to Richmond Road, just as Merton did (and all other streets running south into Richmond Road). 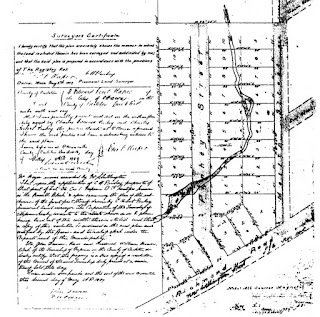 My only and best guess is that because of the positioning of the existing house that Russell had built (which I believe was on lot 5 fronting Richmond), combined with the angle that Richmond Road formed crossing Pinhey, that creating the jog was the best way Pinhey could maximize frontage onto Richmond, and be able to create 6 individual lots on Richmond (which held exceptional value at the time, Richmond being the main thoroughfare going west out of Ottawa, of course). From the records I have, it is difficult to say with full certainty that the 1878-79 house built by Russell was definitely on lot 5 on Wellington. In the 1890 Nepean Township assessment rollbook, it is the only lot fronting on Richmond with a house completed on it (there are a total of 8 houses listed as already built in the new subdivision by assessor's visit in mid-March of 1890), and also has the highest assessed value than the other 7 houses. But the possibility exists that the Russell-built house was on one of the other lots, and set back from Richmond Road, but this seems quite unlikely. If the tenant from 1889 (Fraser) had still been present in 1890, then the location would be more confirmed, but it appears she moved out in early 1890, pre-assessment. In the Russell house on lot 5 were Irish immigrants, 60-year old shoe-maker named Abraham Lattimore, and his wife Margaret. 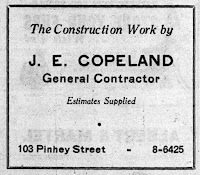 After Pinhey registered the subdivision, lot sales began immediately, and construction of small houses began just as quickly. By early 1890, there were 8 houses completed in the section: one on Richmond Road, four on the west side of Merton, two on the west side of Pinhey, and one on the east side of Pinhey. Of the first three houses built on Pinhey Street in 1889-1890, only two remain. 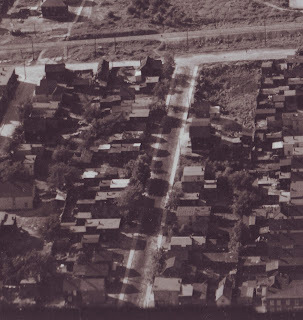 They are now #62 Pinhey, standing on the south-west corner of Ladouceur, and #103 Pinhey, standing just south of Armstrong on the east side of the street. 103 Pinhey Street (co-oldest home on the street) in August 2015. 62 Pinhey was built by John McCrimmon, who was employed as a teamster. McCrimmon built this wood-frame home on lot 11 for his 7-person family. The house (including the land it stands on) was valued at $175 on the 1890 Nepean Township assessment roll. 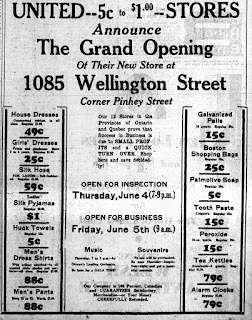 103 Pinhey was built by Thomas A. Stott, one of Hintonburg's leading merchants of the era (he owned many properties in the village, and his flagship shop was up on Wellington in what is now Larry's Pawn Shop/Bryan's Refrigeration). 103 Pinhey was rented to tenants upon completion (the first residents were 40-year old labourer Peter Jenson and his 4-person family) in the home valued at $200. The third house built on Pinhey in 1889-90 was constructed by James Coughlan, a ‘stoker’ by profession, on the lot next-door to 62 Pinhey, lot 10 (this house was 66 Pinhey Street for many years, but has since been replaced by a huge three-storey house). James and his 5-person family moved in to the home, which was valued at just $150 in the 1890 Nepean assessment. It is also interesting to note through the comparison of official records from Land Registry and the Nepean assessment rollbooks that Pinhey operated his real estate affairs in a casual manner, as some other plan-holders of the era similarly did. He allowed individuals to purchase lots, and even build homes on them, but the registration and even the payment for the lot was not required until many years later. Thus, over the earliest years, it is the assessment rollbooks which tell the story of the true growth of the street, and not land registry documents. In 1891, a fourth house was completed, at what is now #70 Pinhey, by eventual long-time Pinhey Street resident Patrick Christopher. A year later, there were four other houses built: Andrew Deevy built a larger house on lot 5 (#90 Pinhey, since demolished); Moses Joannise built a small house on the north half of lot 4 for his 9-member family (long gone); Joseph Potvin built a small house on the south half of lot 4 for his 7-member family (also long gone); and the first home on the east side of the street was a small home built by Joseph N. Trudeau for himself, on lot 4 (which is also long gone). 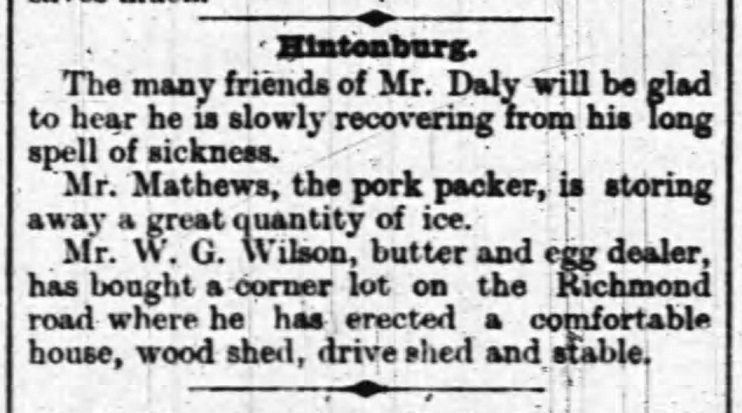 In December of 1893, Hintonburg became an independent village, separate from Nepean Township. That same month was when Pinhey passed away. His Hintonburg land holdings remained under the title of Charles’ estate, and it appears his wife and/or children for many years continued the active business affairs on the land, including lot sales and the overall development of the property. In the summer of 1895, four of the lots on the plan were expropriated to the Village of Hintonburg, and a new plan (Plan 155) was registered to allow for the extension of Armstrong Street to the west (prior to this, Armstrong stopped at Merton Street, however it was decided to extend it westwards through the Plan 105 property, and beyond, following the path of Cave Creek. The purpose of this was to establish a formal ditch and eventual sewer system along Armstrong Street to combat Cave Creek. Evidence of the control of Cave Creek can be seen in the 1901 fire plan below, which shows it running on the south side of Armstrong past Pinhey, before it turns north to run behind the backyards of Pinhey and Merton homes. Cave Creek would be remedied years later (to be detailed in a future blog post coming on this subject very soon!). is called "Middle" at right. Still no development north of Ladouceur. 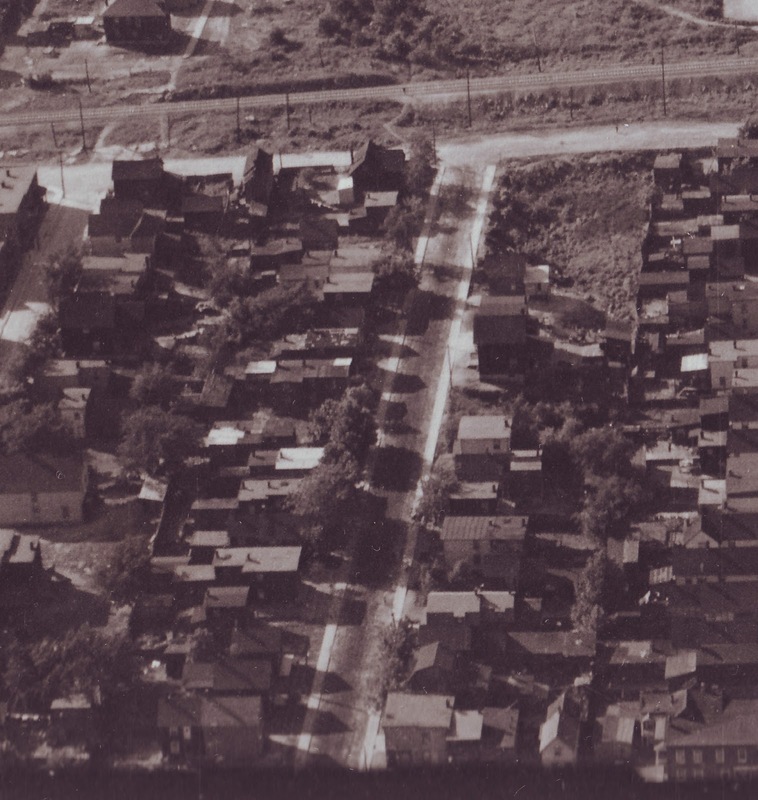 The first two homes built on the new section of Pinhey Street were on the west side of the street, on lot 14. In the spring-summer of 1905, Joseph Albert and Baptiste Albert each built a small home on lot 14 (Joseph on the north half, Baptiste on the south). Both worked as general labourers. 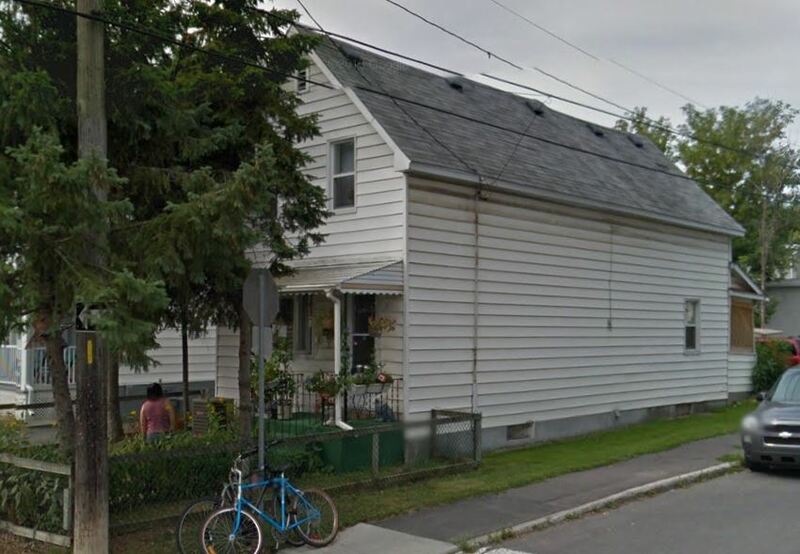 Joseph’s home still stands as 46 Pinhey, and Baptiste’s stands as #48. 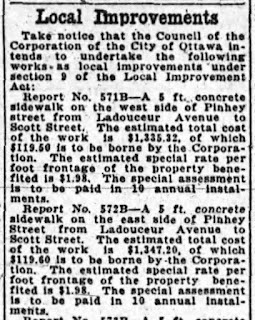 What was kind of interesting about this new opening of Pinhey was that the original Pinhey houses started numbering at #1 and #2 going south, from Ladouceur. Thus when the new houses began popping up north of Ladouceur, there was difficulty in numbering them. The city directories labelled them as "3rd north of 2 Pinhey", "8th north of 2 Pinhey", etc. So around 1908-09, the entire street was renumbered. It did not take long for houses to fill the street out, and by around 1912, the street was essentially fully built up of wood-frame homes for blue collar workers. a nice large tree where Giant Tiger now stands! 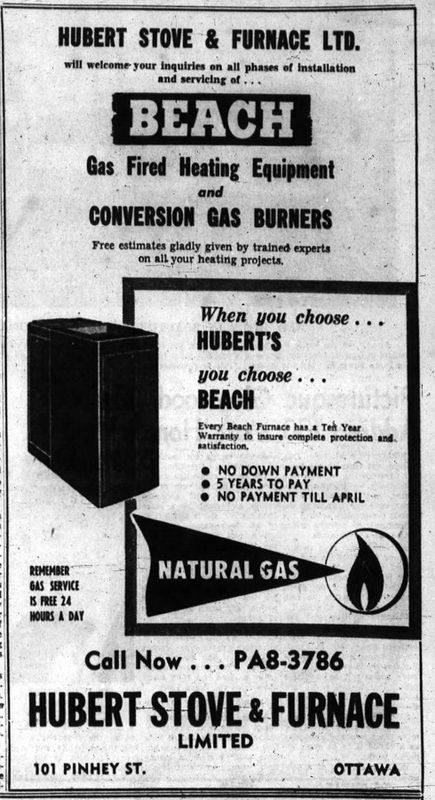 The story of commercial enterprise on Pinhey starts and ends with Hubert Heating. Started in 1922 by August E. Hubert, a former steel worker at the Beach Foundry, it took over 101 Pinhey from Frederick C. Menagh who operated a shop called "Foundries Limited", which dealt in brass and bronze castings, power and lights. 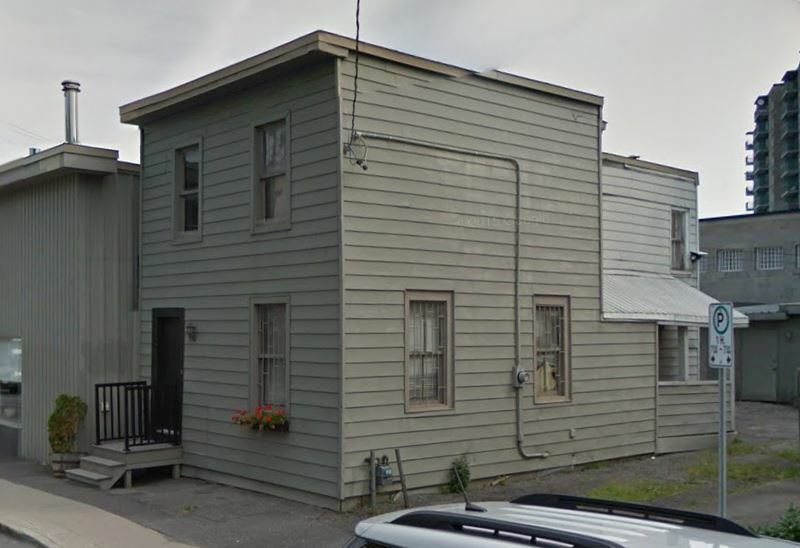 The rear warehouse portion was first built around 1910-11 by Lauzon Bros (Adolphe and Omer Lauzon) who were blacksmiths. 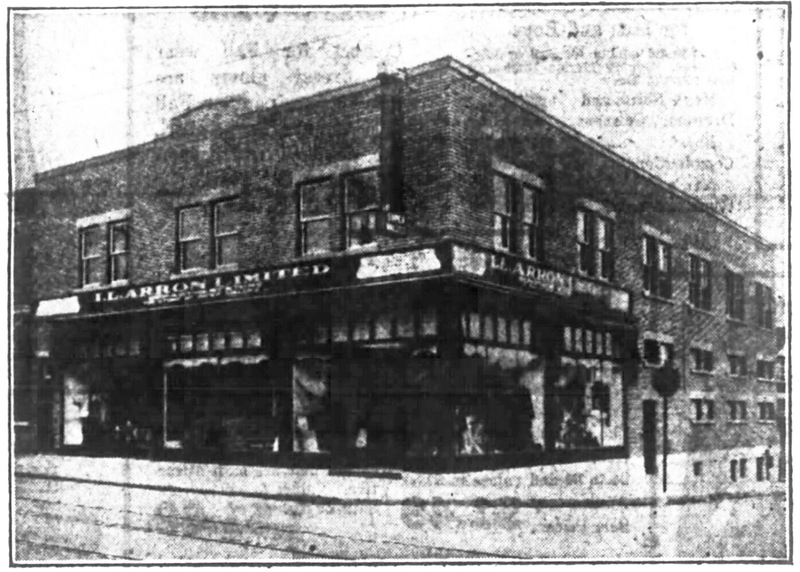 The Lauzons went out of business in 1914, and the building sat vacant before Menagh acquired and expanded between 1917-19. 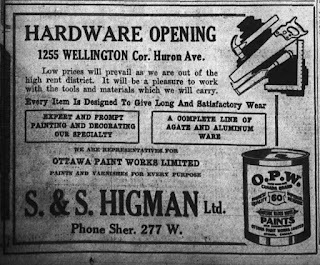 By 1924, Menagh had sold the building to Hubert, whose family continues to operate their storefront and shop at the corner of Pinhey and Armstrong, where they have been for over 90 years now. 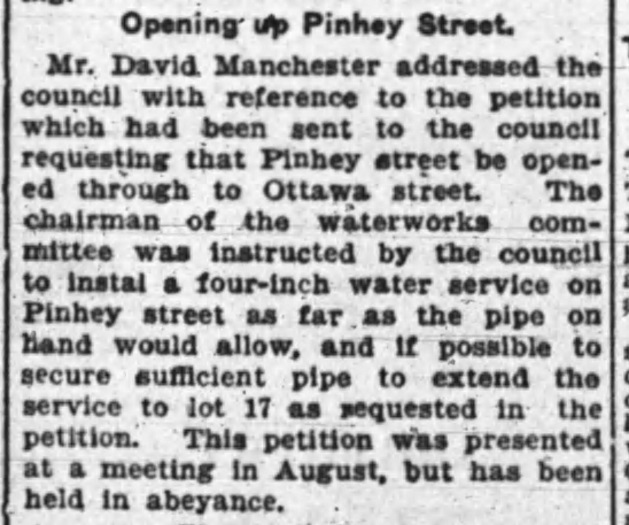 Ottawa Journal - October 31, 1925. 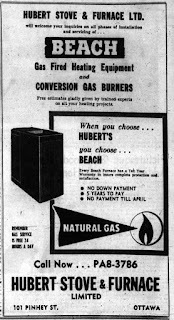 The earliest ad for Hubert's I could find. 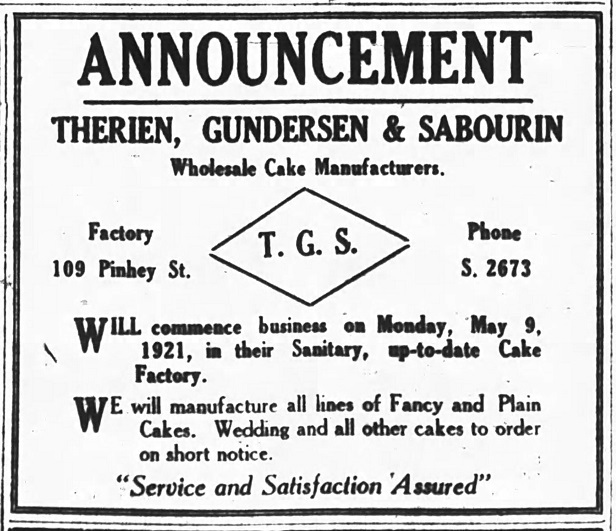 Other than Hubert's, Pinhey has also been home to a variety of other businesses. Certainly at the corner of Wellington, the intersection has be a hub of commerce dating back to the 1800s. Where Giant Tiger exists now was originally acquired by butter and egg dealer William G. Wilson in 1891, and on this spot he built a moderate-sized house. Wilson later dealt in real estate and insurance, becoming one of Hintonburg's most well-known citizens, and remained on this location until 1912, when the last portion of the house was demolished (sometime around 1910, the front part of the house was lost, either through fire or demolition, leaving only the back room which Wilson used as an office for his real estate business). The lot remained vacant until 1930, when Isidore L. Arron built a grand department store (which is now better known as Giant Tiger). 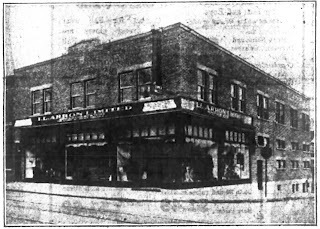 Arron had opened a store at 1020 Wellington in 1923, It's grand opening was held in October of 1930, and was described in great detail in the newspaper: "This, the first and only departmental store in that part of Ottawa, is an imposing building of three storeys in height, attractively constructed of buff brick, with the entire ground floor frontage composed of a series of spacious show windows, interestingly dressed with smart Fall styles. Inside the Arron store, gleaming walnut fittings form an effective contrast with the snowy white of walls, ceilings and pillars, and unique lighting fixtures of opaline glass and crystal achieve a pleasant lighting effect. A branching staircase at the back of the main floor leads to the broad mezzanine gallery and upwards to the pleasantly appointed second floor, while another broad flight of stairs brings one into the commodious basement." It continues: "The first floor of the new Arron store has been laid out to permit the shopper to pass from department to department at east, along wide aisles which separate the newest of counters, of gleaming walnut like the fittings throughout the shop. Flanking the front entrance, the hosiery and glove sections are conveniently at hand, and from them one passes to the millinery department where the smartest of the season's creations are attractively displayed. The corset and lingerie sections, the fancy goods, the infants' wear, the luggage and the dry goods departments are each in turn accommodated in a manner which makes it delightfully easy to shop conveniently. Along one side of the store, the men's furnishings and clothing are displayed, with convenient fitting-rooms and gleaming mirrors at hand. Here presides Mr. Oscar Couvillon, one of the oldest merchants in the city, who was for thirty-nine years with Bryson-Graham Limited, and later in business for himself for some twelve years. The shoe department, also on the first floor, is in charge of Mr. Leroy L. Arron, the son of the president of the firm, and Miss Yvonne Mercier, who has been with Arron's for five years, supervises the dry goods section. A convenient side entrance opens on to Pinhey Street and broad stairways lead from the main floor to the basement below the mezzanine and second floors above." The basement contained a "surprisingly well-stocked electrical department, displaying everything from bulbs to electric stoves. Here too one may select wallpaper, oilcloth, paints, crockery, aluminum, kitchenware, soaps and countless other household furnishings and necessities...it is a veritable treasure trove for those in search of home needs." Sadly, business must have gone exceptionally poorly for Arron that winter, perhaps combined with the economic depression which had hit North America, but it was just five months later, in March of 1931 that Arron was holding a forced bankruptcy sale. Later that year, the main floor of the store was taken over by the United 5 Cents to $1 Store. The upstairs was renovated and became a billiard hall, athletic club, upholstery business, and for many years a bowling alley. Giant Tiger purchased the building in 1972. On the opposite corner of Wellington and Pinhey (the north-east corner, now Morris Formalwear), this was also William G. Wilson's property. 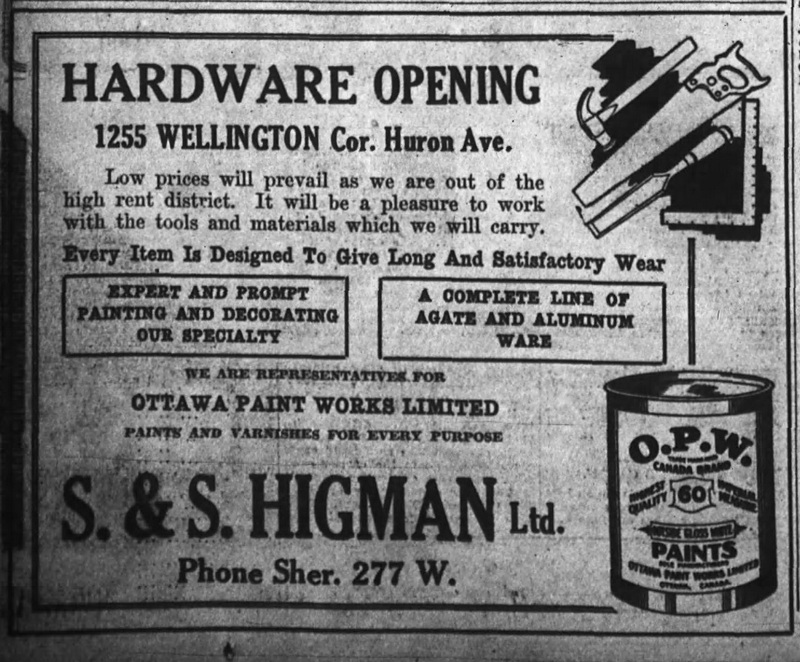 He moved his insurance business here in 1913, around which time he expanded the smaller building that existed at the corner (previously there was a gap between 1083 and 1079 Wellington). Wilson moved his business into the new 1081, which has operated as something different almost every few years since: jewellery shop, shoemakers, lingerie shop, barber shop, sports card shop (where I had my first job in the early 1990's, at Big Time Sports Cards), and so on. The 1081 portion was absorbed into 1083 in the late 1990s. 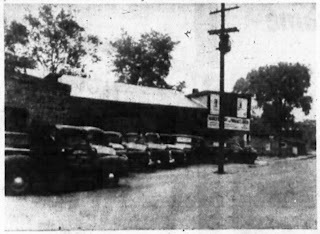 The 1083 portion has also had a variety of uses over the years: it was Leonard Delphis' fruit stand (1918-1920), Abraham Kahan's shoe store (1921-1927), West End Beauty Parlor (1928-1930), Muir's Shoe Store (1932-1940s), Reward Shoe Store (1940s-1950s), etc. On Pinhey itself, there have been a few businesses operating over the years. 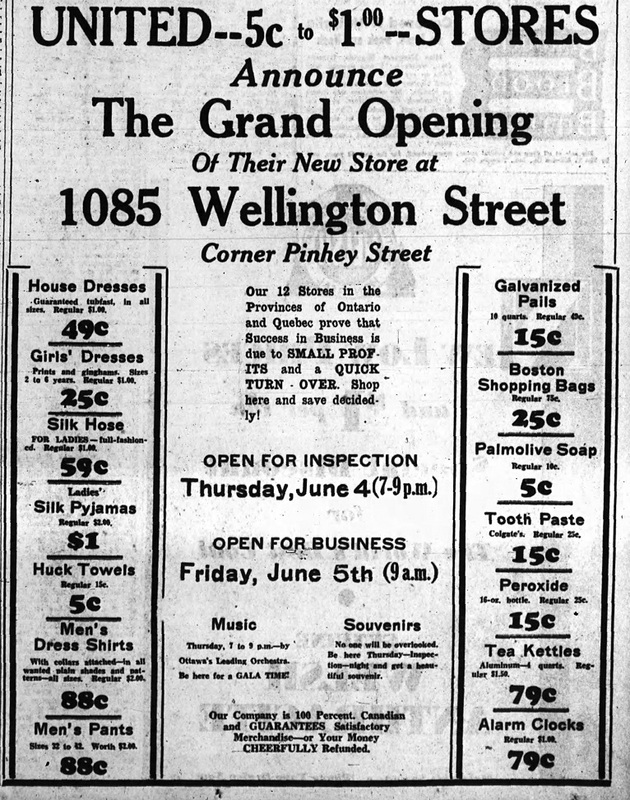 51 Pinhey was the site of a long-running general and grocery store. Built around 1909 by David St. Amour, a Sandy Hill merchant, it began life as a store operated by Joseph Sauve. but was probably run the longest by Eugene Soubliere (prior to 1932 to mid-1940s) before being converted to a regular house in the mid-40s. This house later became infamous in the area for being a flophouse, drug den, etc. and was demolished in June of 2010 after years of work by the community association. 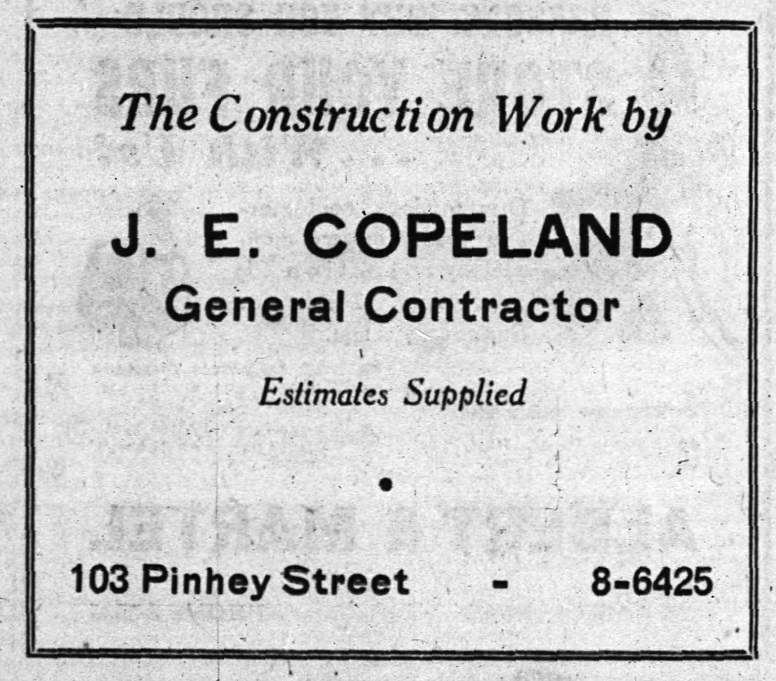 103 Pinhey was for many years a home office which was the home base for John Copeland's general contractor busines. Raoul Lepage and his family operated a furniture building & repair and cabinet-making shop out of his home at 49 Pinhey for many years, covering most of the 1940s and 1950s. Also of note, 6 Pinhey Street was home to the 'Red Lantern Restaurant and Confectionery' for most of the 1950s and 1960s. 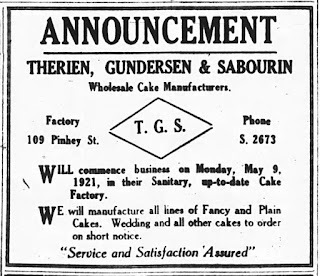 109 Pinhey was built a large 1-storey brick building constructed in 1921 as a "Cake Factory" by three bakers, but their endeavour was short-lived, they were out of business by 1923. The Johnston Press moved in afterwards until the mid-30s, when the place became residential apparently. The building lasted until the early 1980s. 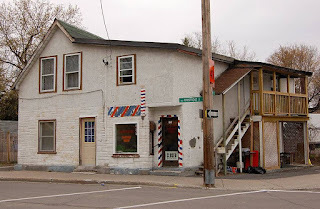 Finally, most of us will remember Vince's Barber Shop at the north-west corner of Armstrong. 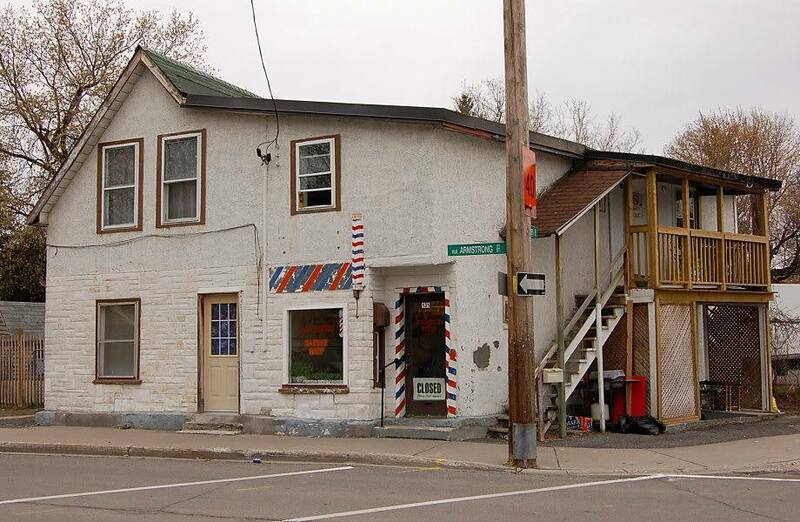 This was 98 Pinhey, and was originally a cobbler's shop, which dated back to the 1907-1909 period of construction. Oliver Regimbal being the shoemaker who first occupied the building. It was later operated as a grocery shop/confectionery by the Regimbals and later the Charbonneaus, before becoming Gustavo's barber shop in the 1960s. Vince's Barber Shop, a long-time staple at Armstrong and Pinhey. 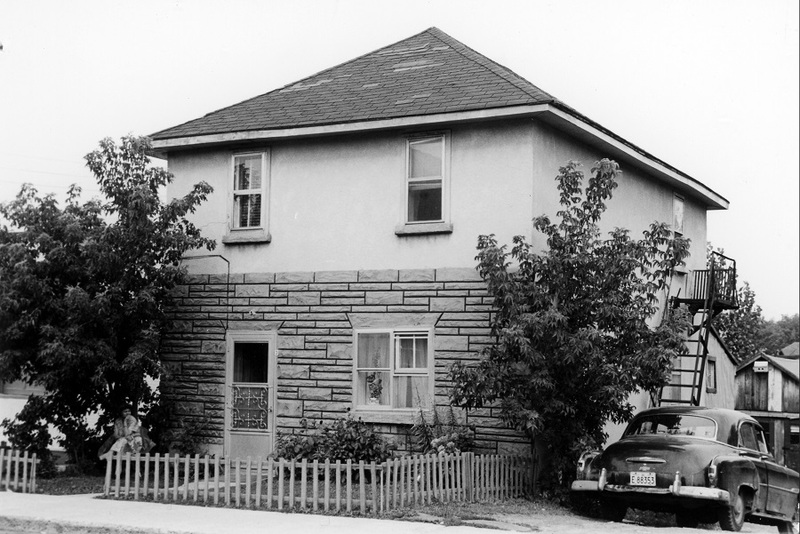 First off, here is a house that existed until 1969, which was immediately behind what is now the Giant Tiger. Like, literally right behind it, to the point that front porch appears to be within an inch or two of the back corner. 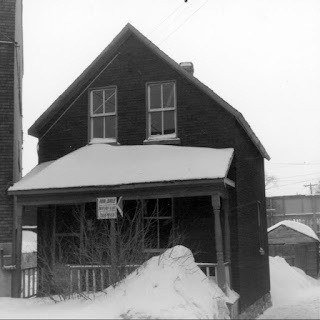 108 Pinhey Street in February of 1969. You can notice the back edge of the Giant Tiger building at left. This house was at the far north end, at 3 Pinhey Street, but was lost soon after the World University Service building was constructed in the mid-60s. 3 Pinhey Street in September of 1964. 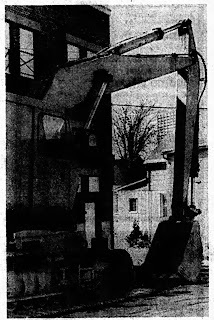 The north end of Pinhey, from April of 1966. Scott Street at right and Ladouceur at left. 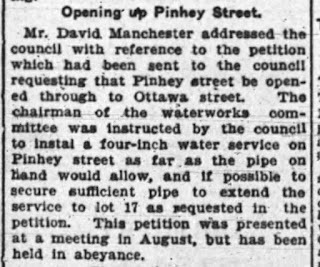 As always, here are a few random newspaper articles about some interesting/comical events that occurred on Pinhey Street over the years. This is just a tiny sampling of course. for the north half of Pinhey Street. Tuesday February 16th: live at City Hall for Heritage Day! The annual Heritage Day is next Tuesday, February 16th. I'm happy to announce that I will have a booth set-up at City Hall for this great event put on by the Council of Heritage Organizations in Ottawa. The event is free admission, and is open to the pulic from 11-2 in the large main hall at City Hall, and will feature a lot of displays, an official ceremony, a quiz, and many other highlights. I'll be on hand to promote the history of Kitchissippi, and will have a few maps, photos and artifacts at my booth to share with anyone stopping by.